March 30th in Wordpress Plugins by Wordpress Jedi . Here is another plugin that lets you turn YouTube videos into WordPress posts. 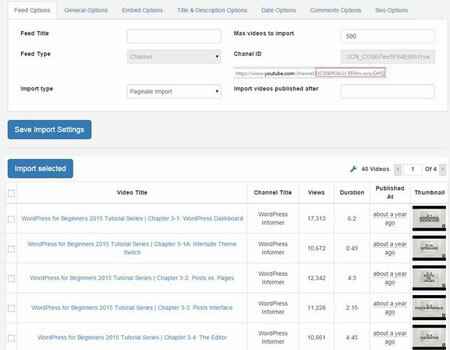 YouTube Videos To WordPress Posts allows you to import videos based on user, channel, ID, and keyword. You can schedule tasks or bulk import videos to set up your site faster. The YVTWP script lets you keep the number of views, likes, and other stats synced with YouTube. You can also import comments, tags, and other info. The plugin also checks for broken videos and skips duplicate videos. It adds rich snippets for videos important to keep your site search engine friendly. Webmasters have the option to limit the number of videos imported. It has its own caching system and uses YouTube API v3.